That's good news for Sweden, which has a lot of toxic arsenic in its water. If you happen to be thirsty in the woods, there are a lot of things you can stick in your canteen to help clean up your drinking water. There are chlorine pills and filters (not crystals — never crystals). And now scientists have identified a certain kind of moss that could do it, too. The moss is called Warnstorfia fluitans. It grows in Swedish wetlands contaminated with the toxic arsenic from nearby mining operations. 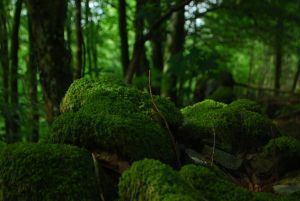 Researchers found that the moss brought the arsenic levels of water down to drinkable levels surprisingly quickly, according to research published in the journal Environmental Pollution. In northern Sweden, iron mines have contaminated much of the water with arsenic, a metal that is also toxic to humans. That harmful combination works its way into agricultural products like rice, traveling throughout the food web. Researchers from the University of Stockholm hope that introducing this moss into wetlands could help clean up the area. To test it in a controlled lab setting (that’s science-ese for “no one has tested this in the field yet,”) the researchers started with water that contained ten times the amount of arsenic deemed safe by the Environmental Protection Agency. When they exposed the moss to it, the moss took just an hour to absorb 82 percent of the arsenic. But further tests showed that higher concentrations of arsenic, plus mixing in other miscellaneous compounds, slowed down the filtration process. That’s a bit closer to real-world conditions, so that lab ideal would be far from how this moss performs in an actual arsenic-contaminated wetland. But even so, researchers found that the moss was able to tolerate arsenic concentrations 1,000 times higher than the EPA’s maximum before it showed any signs of toxicity itself. So how did the moss survive after taking in all that harmful arsenic? The researchers found that most of the toxin was being bound to the moss tissue, rendering it harmless. And because very few organisms eat wetland moss, this could help break the cycle of arsenic poisoning in which predators become sick after eating contaminated prey. The road from laboratory tests to successful environmental cleanups is long and arduous, but if researchers find that it helps to grow this moss in and around streams with dangerous levels of arsenic, we may be on our way to an inexpensive, handy solution to a serious ecological hazard.